While grown-up authors labor intensively over their books, kids love to make their own books and will dash off a few at the drop of a hat. My kids love to grab a small stack of white paper, staple it together, and create whatever’s in their head. Some take inspiration from a school project like an alphabet book. Others create their own comics based on favorite stuff animals. Then there’s the military history ones full of battle maps, tanks, and soldiers. Kids can also use the mini book format to record vacation memories. 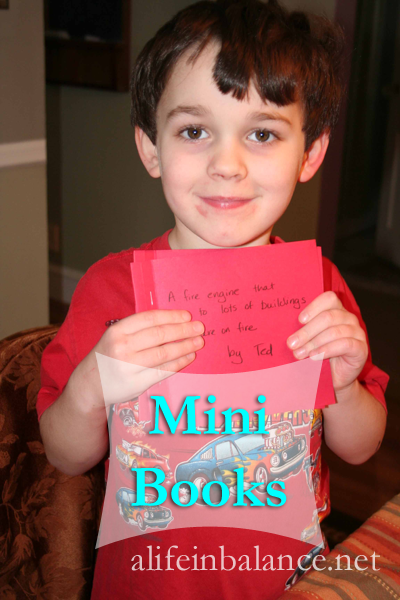 One of our favorite mini book templates was inspired by the mini books used in lapbooks. 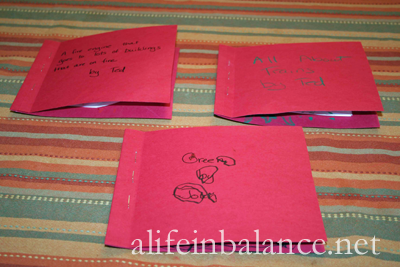 Take a discard file folder and cut it in half to create 2 folded covers. Or, use card stock cut into smaller pieces. Cut up scrap paper for the inside pages. Put everything together and staple the book together. Get creating! When I worked with my 4 year old on his book, he dictated the story which I wrote down for him. Then, he made the illustrations. Sometimes, younger ones like to tell a story they’ve heard, like a favorite picture book. I love hearing them retell the story. Older kids can write their own stories and do their illustrations. 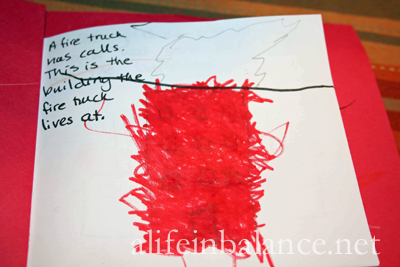 Give older kids free reign with the art supplies; you’ll be amazed at what they come up with. By the end of the summer, you may have a bookshelf full of original stories! Those books are adorable! What a great indoor activity. shae just wrote a comic last night, i should make it into a book! Yes, that would be awesome! My kids like to write comics, too. This is a great idea to keep kids writing and learning while having fun during the summer. Great idea! I should start doing this with my daughter because she tells amazing stories! It’s hard to imagine how many we’ve lost by not documenting them. Thanks for the inspiration! I LOVE this!!! I am huge on the kids writing stories. These books will be such a treasure to you, your kids and their future family! PS – HE is gorgeous!! That’s my second son who is now 9. He’s always been so photogenic. It’s hard to take a bad picture of him! What a great idea! I love to see children’s creativity come out! the grandbabies love to make mini books Fun activity for everyone and a great keepsake too! Kristina & Millie recently posted..Snickerdoodle Sunday – Going Green in March! Barb, I remember doing this as a kid!! I love it. My little ones have made big books (full sheets of paper) but I think I need to throw back to my times and start making these with them. Thanks for a reminder and visit to my childhood!! Smiles! Elizabeth recently posted..Happy Father’s Day Tie – Free Printable!